We had a great time this summer. You can read all about our second annual tour. If you're starting to think about your 2019 vacation and you've always wanted to go to Ireland, come with us! You don't have to be a harp player to love where we're going and what we'll be doing on the third annual tour. Just as the Harpers Escape always strived to stay small in size, our tour this year will be limited to just 35 people. It is “first come, first serve”. Reserve your seat with a deposit. It's a small tour but large in hospitality, friendship and conviviality. It is open to all. You don't have to be a musician to come! Please feel free to share the tour information with your friends and family! See the rest of this page for the itinerary for the 2019 Tour. 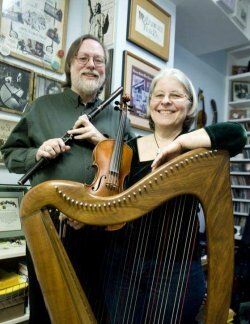 Daily doses of harp & trad music! See our 2018 tour story. It's Ireland! There's plenty of history, breathtaking scenery and there will be plenty of traditional music! Here is our proposed route and some of the highlights along the route. Day 1: You arrive and Meet up with us at Dublin Airport by 9am. 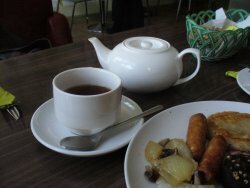 We'll stop en route for tea & scone and a lunch. We head west across the country to County Donegal. 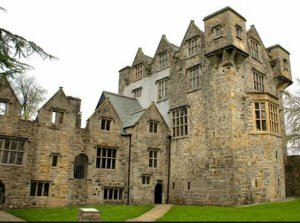 When we arrive in Donegal town, we'll stop at the 15th century Donegal Castle and the ruins of Donegal Abbey. Dinner at the hotel & music session to follow. Glencolmcille Folk Village and up to Ardara Heritage Centre which tells the story of Donegal tweed from the shearing of sheep to the manufacture of the woven cloth. 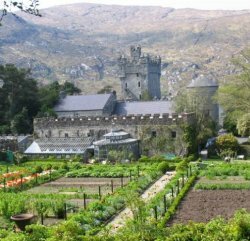 Day 3: Another sceneric day with a trip to Glenveagh National Park, with a walk through the Castle Gardens. Time-permitting, we'll make a trip up to Doe Castle, the stronghold of the MacSweeney clan for 200 years, on Sheephaven Bay. Day 4: We'll stop at yet another castle, Parke's Castle, in Kilmore enroute to Drumshanbo. 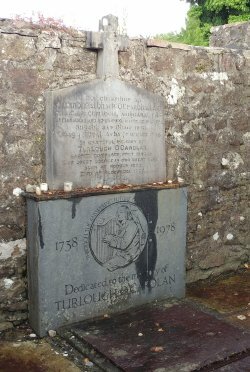 Visit to Carolan’s Grave in Kilronan Cemetery, outside of Ballyfarnon. We'll have a lovely dinner at the hotel followed by evening concert and session with special guest fiddler John Carty. 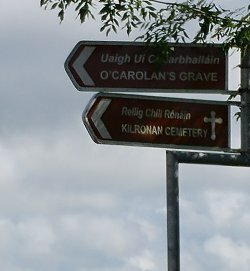 Day 5: You can explore Leitrim and Roscommon on your own. 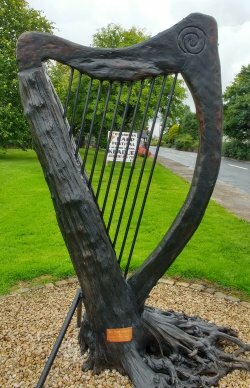 Our stay coincides with the O'Carolan Harp Festival in Keadue. A bunch of us go over to the harp competitions in the morning. 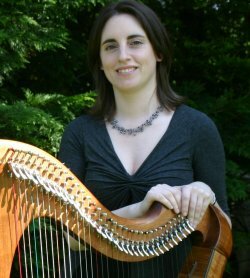 Harp workshops at the hotel in the afternoon with Grainne Hambly & "artist to be named later" are included in your tour. Views of Lough Allen. Evening concert at the hotel with Grainne & Billy. Session to follow. 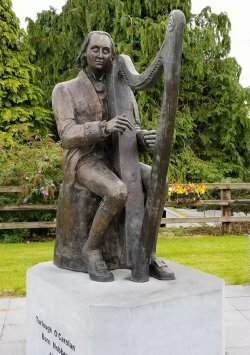 Day 6: We leave In the morning and head to Nobber (Carolan's birthplace) for an exclusive afternoon concert at the George Eogan Cultural & Heritage Centre with Dearbhail Finnegan & Grainne Hambly and the Meath Harp Ensemble, like last year. This was an awesome event for us in 2017 & 2018! We stop at the Carolan statue on the way into town for the group photo! A soup & sandwich lunch at Nana's and then time to walk through the historic St. John's Cemetery, which is adjacent to the Cultural Centre, formerly the church. Dinner at the hotel & session to follow. 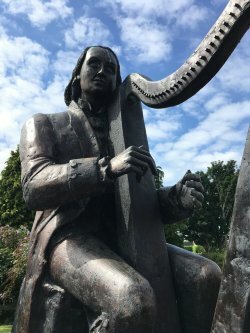 Day 7: 1792 Belfast Harp Festival historical walking tour. 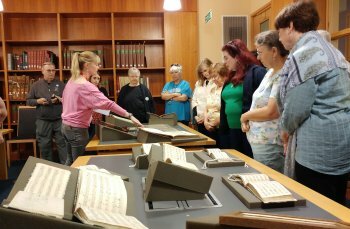 We start out at Queens University for an exclusive showing in the Special Reading Room of the original Bunting manuscripts and other related artifacts, along with a lecture on Bunting. A lovely walk through the Royal Botanical Gardens, which are conveniently located right next to the McCray Library where the Bunting exhibition will be. A coach tour of the Murals of Belfast and an educational eye-opening tour about The Troubles. 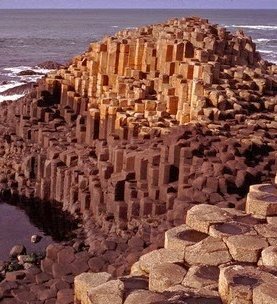 Day 8: Tour the Antrim Coastline with stops at the Giants Causeway ( World Heritage site pictured above) in Bushmill plus the Carrick-a-Rede Rope Bridge. 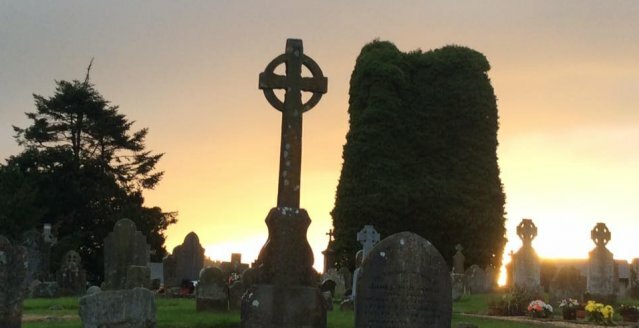 Time & weather-permitting we'll make a stop at St. Aidan's Church in Limavady to visit the grave of noted 18th century harper Denys Hempson (who was the oldest harper at the 1792 Belfast Harp Festival). 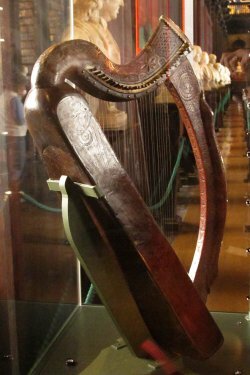 His harp lives on in a glass case in the Guinness Storehouse in Dublin. 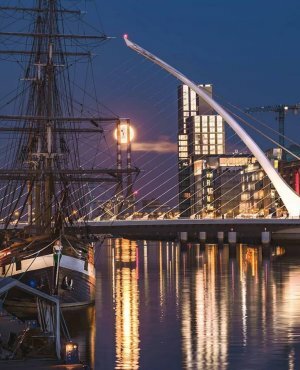 Our hotel is conveniently located near Trinity College and the quay on the River Liffey, just a 5-minute walk to the Samuel Beckett Bridge, which we fondly call the "harp bridge." 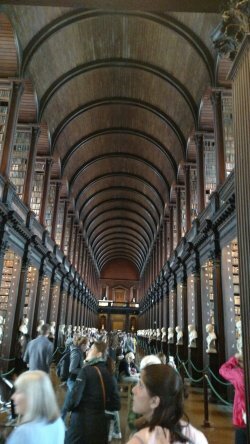 Day 9: Trinity College to see the holy grail of harps, The Trinity College Harp (sometimes called the Brian Boru harp) in one of the world's most beautiful libraries, The Long Room, and the "must see" Book of Kells. 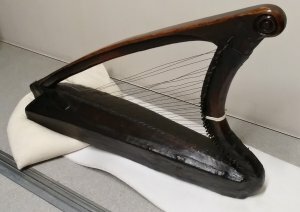 Exclusive "behind the scenes" showing at the National Museum at the Collins Barracks of the historic harps of Ireland in the storage area of the museum. This was a real highlight of our 2018 visit, when only 20 of us were permitted in to see them. This year will get a chance to see these harps! See my 2018 account of the visit to the Barracks. Dinner at the hotel Daily dose of music to be determined. Day 10: EPIC, the Irish Emigration Musuem, and the Jeannie Johnston, (pictured here with the harp bridge) an incredible Famine museum to end our stay in Ireland. The rest of the day is "on your own" to explore the city. Goodbye session at the hotel. We encourage the players coming on this tour to bring their fiddles, flutes, tinwhistles, concertina and other trad instruments easily gotten on a plane. Don't worry harpers! We'll be arranging to have harps waiting for us in Ireland! We'll have to share but you will be able to get in some playing while you're there. Gráinne Hambly and Kathy DeAngelo & Dennis Gormley will be our resident, lead musicians. Guest Musicians we've lined up so far: Gráinne Hambly & William Jackson (of course! ), Dearbhail Finnegan, Patrick Davey, Conor Ward, and a few surprises along the way. 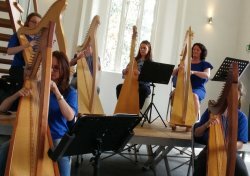 For the harpers: an optional activity harp workshop with Gráinne Hambly. We'll arrange for the harps. Don't worry about what playing level you're at. There will be 2 groups. Single rooms available for an additional $500. If you're a single person traveling alone, come! We can link you up with a roommate. All seats are first come/first serve. Deposit of $500 holds your reservation. Click here to download the reservation form. The first invitations went out to those on our mailing list in late October. We'd love to have you join us but please don't procrastinate to reserve your seat. If you'd like to chat with Kathy about the trip and travel issues you may have, please call her at 856-795-7637 or email her. *Passengers will make their own travel arrangements and will be given a time/location to meet the coach in Dublin Airport on Tuesday July 30. We advise travelers to purchase their own travel insurance. We cannot refund your payments after December 31. **Price based on exchange rate on 9/9/18 and on 35 passengers traveling. Rate may change depending on exchange rate changes or fewer passengers. Cancellations & Refunds: You may cancel your reservation and get a full refund of your deposit up to Dec. 31, 2018. You may also transfer your reservation to another person at any time. We might be able to help you find someone to take your reservation. We advise purchasing travel insurance. I want you to be completely confident in how this tour will be organized and managed! 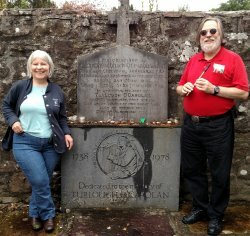 Here are the folks who are involved in making the Harp Tour of Ireland the trip experience of a lifetime! 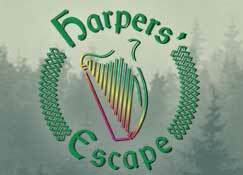 Kathy DeAngelo organized the annual Harpers' Escape Weekend for 24 years. If you've been to the Escape, you know her well! The hallmark of the Escape was its cozy size, which we're carrying into this tour. She and her husband Dennis Gormley have been performing traditional music for more than 40 years. Kathy's organizational skills are legendary. 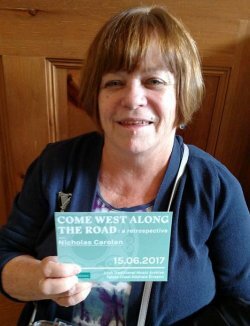 You may know her as the director of the Somerset Folk Harp Festival, the largest folk harp conference in the United States. She, Dennis and Grainne Hambly are your on-site musical hosts for the tour. Marianne MacDonald and Trad Tours have been leading tours of Ireland and Cape Breton for more than 20 years. 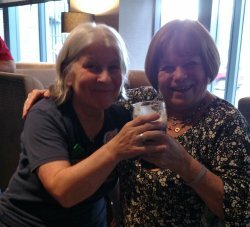 She has been actively engaged in the Irish music and dance community in the Philadelphia area and has her popular Come West Along the Road radio show on Sunday mornings. 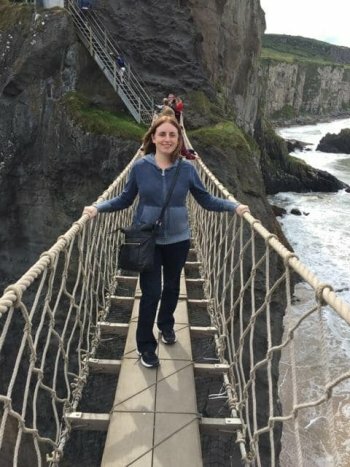 With her extensive connections to traditional Irish musicians in both the US and Ireland, besides her deep family ties in County Kerry, her tours showcase the music, history and culture of Ireland. Contact Marianne: email or phone 856-236-2717. 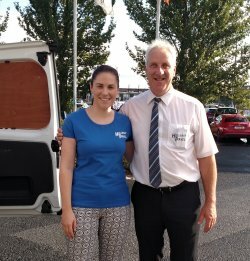 Seamus & Cait Buckley and Holloway Travel, based in Mallow, County Cork, have been coordinating with Trad Tours for eight years. Seamus specializes in individually tailoring tours to meet his client interests and like Marianne, has a deep appreciation for traditional music and dance. On our trip, Seamus will drive our coach and be our guide. We leave the driving and the jokes to him! He's also a pretty fine singer himself. His daughter Cait drives the follow-on van with our luggage and she's a tremendous harp player herself. Gráinne Hambly is one of Ireland's leading traditional harp performers and teachers. She has been on staff at the Harpers' Escape for 15 years and now we get to hear her on her own turf in Ireland! Gráinne is our musical coordinator for the tour and besides arranging our daily dose of harp and traditional music she'll be teaching a workshop one of the days for the harpers on the tour (while everybody else goes on a daytrip). You can expect to see and hear her husband, noted Scottish harper, William Jackson in one of our concerts.